A Changed Life and A Celebration in Rosarito! It was so encouraging to be with Pastor Leo Nevarez, and to hear him tell his story. Addicted to drugs and strung out, he was headed in the wrong direction. God in His grace reached out and redeemed him out of that lifestyle. He married Gloria and neither he nor his wife knew Christ. They were struggling as a young family, and headed down the wrong path. Someone invited them to church, and they said they were going to have Birria (a spicy Mexican meat stew). He thought well I don’t really want to go to church, but I’ll go for the Birria. He and his wife went, and they liked the church. God gripped their hearts, and they came to Christ. Interesting the things God uses to draw people to himself. Now the Lord uses pastor Leo’s background in drugs to minister in the community. He can tell when someone has a drug problem, and he knows how to love on these people. Even while I was out sharing with him and the evangelism team he found a small bag of crystal meth. He opened it up and poured it out on the street, stomping on it. He said there were a lot of addicts that live in the community around the church. As we walked the streets I could tell that he had a keen sense as to whether the young people we talked to were into drugs or not. 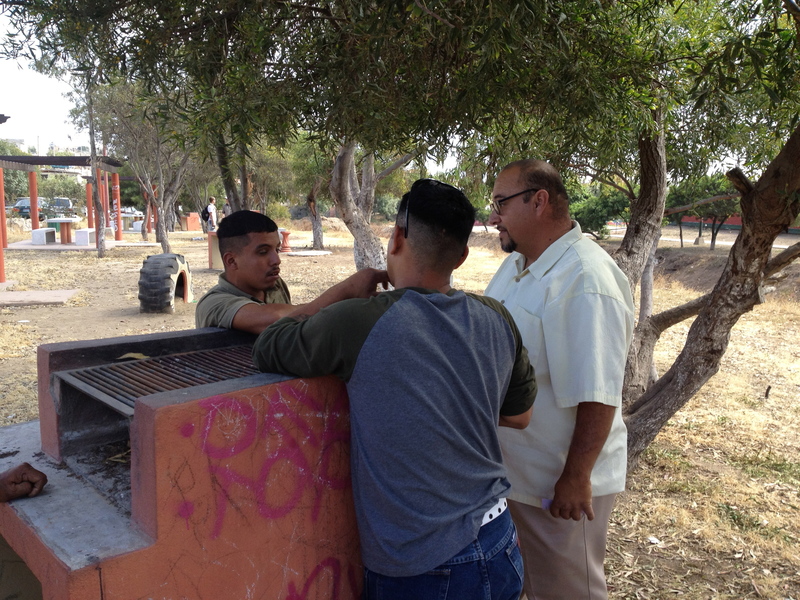 As I shared in my last post when we went out pastor Leo and Luis had the chance to minister to Marvin, who was high on something. Marvin was ripe fruit. He was ready to receive help. Isn’t it great how the Lord uses our broken past for His glory? Praise God for His great work in the City! The beauty moves the door posts of my heart! May God Bless these workers, may they know a reward in heaven, may he supply the laborers into the harvest! Thank you for sharing how He is moving through those with servant hearts! It makes me cry. God bless you and the people He has sent you to! Thank you! I’m glad it encouraged you.